Just a quick hit today - My buddy Dave and I are planning on attending Feast of Blades down in Denver this coming weekend to participate in the big narrative Apocalypse game on Saturday. 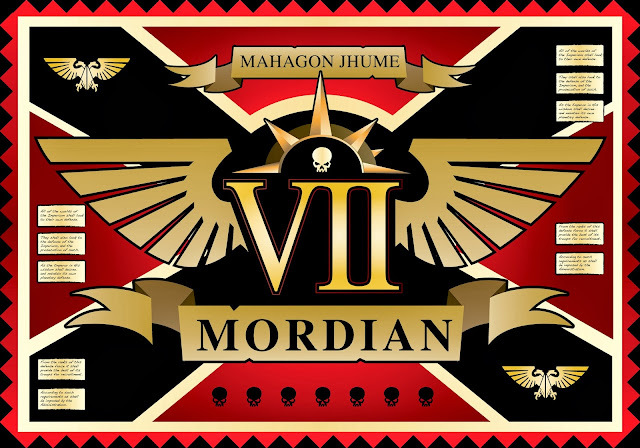 I'll be wearing my Mordian 7th shirt, and should be easy to spot. If you're attending the event, stop by and say hello! I'm planning on taking down the whole regiment which (with the exception of the Leviathan Command Carrier) will be the first time the whole army will hit the table, and be entirely painted! I plan on taking a bunch of pics at the event, should be a really fun time! Have fun man! Looking forward to seeing pics of the whole lot in action! I love that you got that made into a shirt. Have fun at the game! Have a great time and kick arse. @17yearoldhobbyist: Indeed! It's not often that there's a big event like this in my neck of the woods, really looking forward to it! @The Eye of Error: Hah! It's one of my most prized 40k possessions these days, all thanks to your awesome art! @John Lambshead: Oh, there will be copious arse kicking, though I'm pretty sure the glorious 7th are going to be on the receiving end. Hah! @Miniature Tim: The shame! The dishonour! ...The laziness. Hah! Bummed you're not making it out this year, hopefully we can meet up at Adepticon - I'm planning on participating in the heresy events, assuming they run the same sort of thing as last year! Good luck MAN!!!! Kick @$$, have fun, and take pictures!!! I won't be there I'm afraid but have a great time, looking forward to pics! The whole of the M7th in action ? Looking forward to seeing the photos. Iron Hands - Batch painting complete!